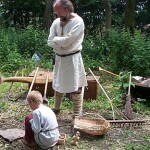 Freyr and Freydis are Viking farmers. They have come from Norway to settle in (local village). They sailed across the North Sea to the Shetland and Orkney islands, then down the east coast and up the river (local). Norway is very mountainous, it is not easy to grow cereal crops. Freyr and Freydis are getting old so have emigrated to find an easier life. 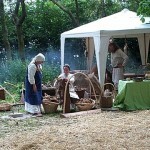 They have heard that there are lots of cheap Anglo-Saxon slaves here to do all the hard work for them. Everything Freyr and Freydis thought they would need for their new farm had to be brought with them in the boat. Animals, farm equipment, household goods. In Norway, Freyr went to sea in the spring while Freydis stayed at home to run the farm. Freydis milks the cows to make butter and cheese that keep for winter. She shears the sheep, spins and weaves the wool and makes the clothes. 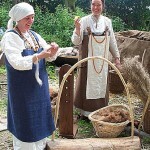 Flax is grown to make linen for clothes too. Other animals on the farm are the oxen, pigs, cats and geese. These all have special uses. 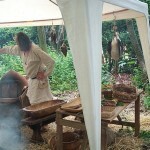 Freyr would catch fish, which were dried for winter, and hunt a range of animals for their furs. Any surplus fish and furs would be traded, and Freydis would expect some jewellery and a strong slave when Freyr came home. Freyr would come home during the summer to help with haytime and harvest. Possibly Freyr went raiding in his youth. The Vikings went north to Iceland and Greenland and south to Byzantium and the Mediterranean. 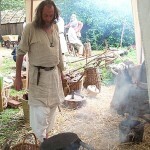 The furs caught by Freyr in the Arctic could be traded for Arabic silver at Scandinavian Viking towns, such as Birka. 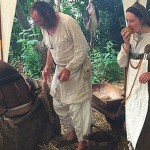 Now Freyr and Freydis have settled in (local village), they will still trade with Scandinavia, exchanging, for example, flour for skins and amber. The jewellery that Freydis wears shows how wealthy Freyr is. Freyr and Freydis are pagans with gods such as Thor and Odin, which are still remembered in modern days of the week. Their Anglo-Saxon slaves are Christian. The first Viking raid was on Lindisfarne, recorded in the Anglo-Saxon Chronicle. Freyr and Freydis do not write like the Anglo-Saxons but use runes to carve their names on objects belonging to them. 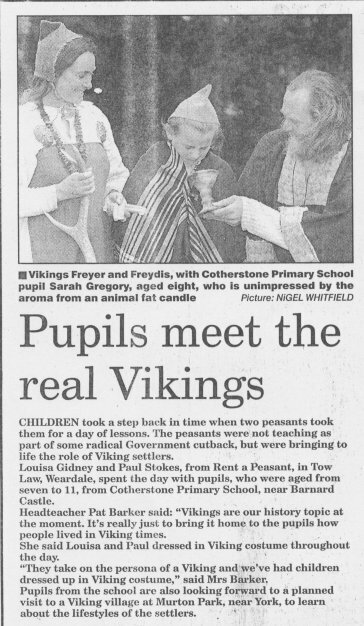 during Viking educational week for schools, June 2002.